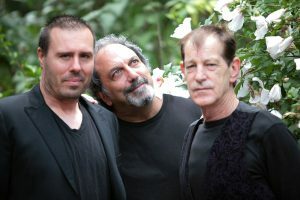 Lilliam Ocean marks the debut release of The Fragile Fate, an unlikely trio comprised of Rupert Greenall, Jerry Marotta and Eric “the” Taylor. All three musicians merge their respective sensibilities and talents to create a musical journey that travels over progressive ambient landscapes filled with tranquil drones to tension filled rhythms and uplifting movements. World renowned drummer and session musician Jerry Marotta has left his mark on recordings by Paul McCartney, Hall & Oats, The Indigo Girls, David Sylvain and Robert Fripp to name but a few. He first entered the music scene as the drummer for Orlean’s with the hit single “Still the One” followed by nine year run performing and recording with Peter Gabriel. Since 1979, Rupert Greenall has provided the sonic synth sound for new wave pioneers The Fixx. Unlike their other new wave counterparts that dominated the MTV airwaves in the 80’s, The Fixx always stood apart as with their deeper, darker sounds that Greenall was instrumental in providing. Rounding out this trio is the ambient craftsman known simply as Eric “the” Taylor. Eric’s layered computer synthesized soundscapes provide key ingredients to The Fragile Fate’s compositions. Making a special guest appearance on “Rolled Over” and “Configuration” is one of the forefather of ambient, musician/composer Robert Rich. In addition to his musical contributions, Rich also mastered the entire album. 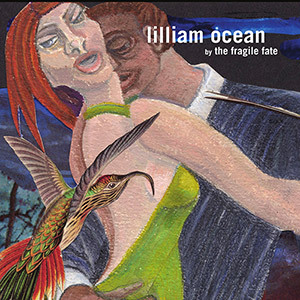 Lilliam Ocean, recorded in Jerry’s basement studio Jersville, transcends the musical boundaries of Woodstock rock and new age trance to create a unique style of organic progressive ambience.